HOW TO PREVENT FIRES OF HAY, STRAW, AND OTHER BALES? The author tells American farmers how to solve an existing from over fifty years problem of self-heating hay bales in the field, in the barn, in the stack. A spontaneous combustion of different bodies is a result of a physical process of self-heating. The self-heating process is an inevitable phenomenon. The nature of this phenomenon is unknown so we cannot protect ourselves against it, therefore self-heating itself has been with us for centuries making our life remarkably difficult. and peat bogs “contaminated” by human activity. The process of self-heating of the above bodies very often leads to a fire. – are very difficult to extinguish because the source of fire is hidden at the deepest place of a burning object. The fires caused by self-heating are counted in thousands in every country. Only in the USA the number of extremely harmful to the environment landfill site fires exceeds eight thousand yearly. It is estimated that in agriculture self-heating itself is the cause of 5-10% of fires. On a global scale, the numbers are expressed in hundreds of thousands or even millions yearly, and the material and non-material losses reach billions of dollars a year. Scientists are not able to find a means of preventing the fires. This means that self-heating will be causing fires until a human has known its mechanism and learned to prevent them. The process of self-heating is a generally applicable physical law. r – a distance from a point to the center of the sphere or cylinder axis. This means that in every sphere or cylinder a temperature increase zone is formed, while the value of the temperature grows rapidly near the center of the sphere or the axis of the cylinder. For a cylinder, the above dependence is graphically depicted in Figure 1. Figure 1. 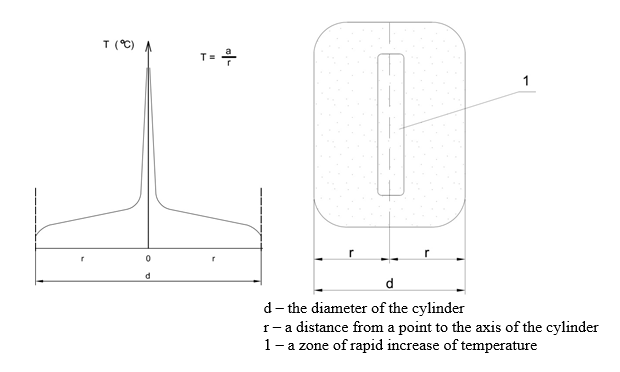 The temperature distribution in a self-heating body (on the example of a cylinder). A compressed hay bale is a perfect example of the above mentioned cylinder and is a subject to the dependencies presented above. 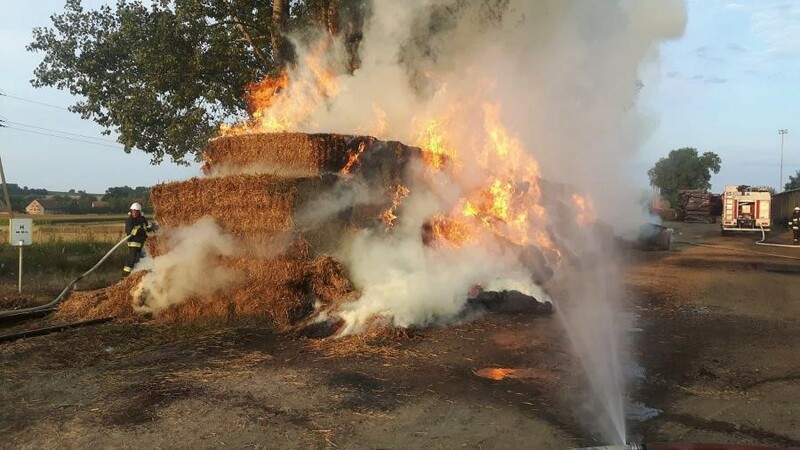 It means that in the central part of each bale, there may occur an uncontrolled rise of temperature that can exceed the flash point of hay, resulting in a fire in tyhe bale of hay. In the case of a single bale, it does not seem to be a problem. when bales in a barn ignite. Figure 6. A fire of bales of hay in a barn. In this case, apart from hay, the farmer’s loss also includes the barn and farming equipment. Besides farmers, unwitting victims of this kind of fires are owners of transportation companies. 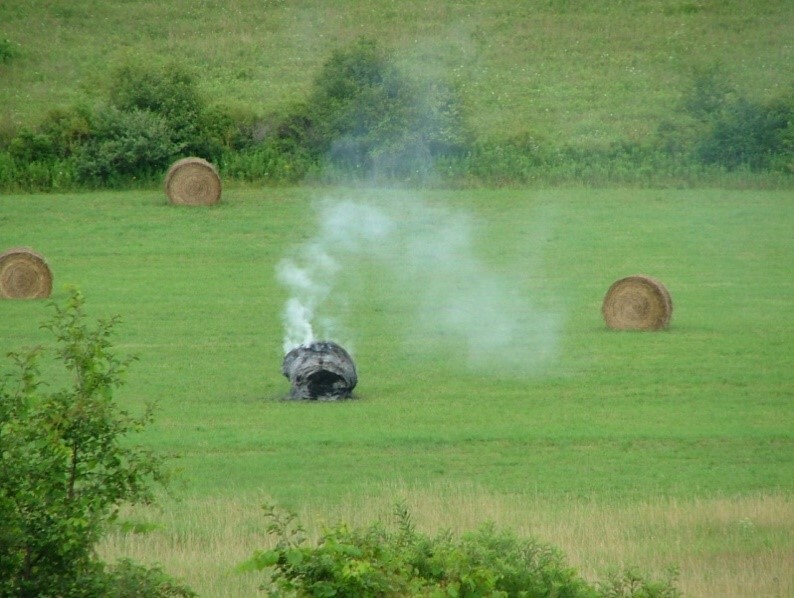 A fire of bales of hay is currently treated as an act of God or the farmer’s bad luck. In the American press, there can be found even such pessimistic opinions. The farmer is completely helpless against such a fire. Once it has been noticed, it is already too late to react. A fire brigade cannot help much either. If the farmer is not insured, such a fire causes a loss which may threaten his future and his family. If the farmer is insured, the financial result of the insurance companies deteriorates. Even if a fire does not occur, self-heating of the bales to a temperature above 50°C significantly reduces the nutritional value of the hay, and heating it to a higher temperature causes that its quality as fodder becomes zero, which results in huge huge financial losses whose compensation cannot be expected by the farmer. The only reasonable way to fight such treacherous fires is preventing them from occurring. On 23.08.2017, the Polish Patent Office granted me a patent No. 227824 for the invention named “The Method of Elimination of Spontaneous Combustion of Pressed Hay or Baled Straw”. 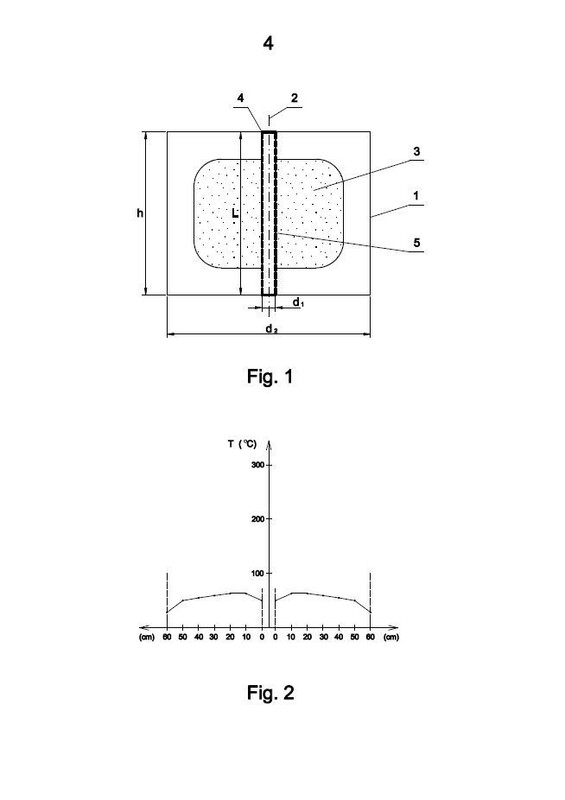 Following are the details of the patent description. The subject matter of the invention is the method of elimination of spontaneous combustion of compressed hay or straw in bales in the shape of cylinder of any diameter, which are stacked in the field or in barns. Bailing with agricultural balers is widely used in the harvest of hay or straw. At the time of their storage in large groups, fires often occur as a result of the self-heating process of compressed hay or straw during the first weeks after the harvest. 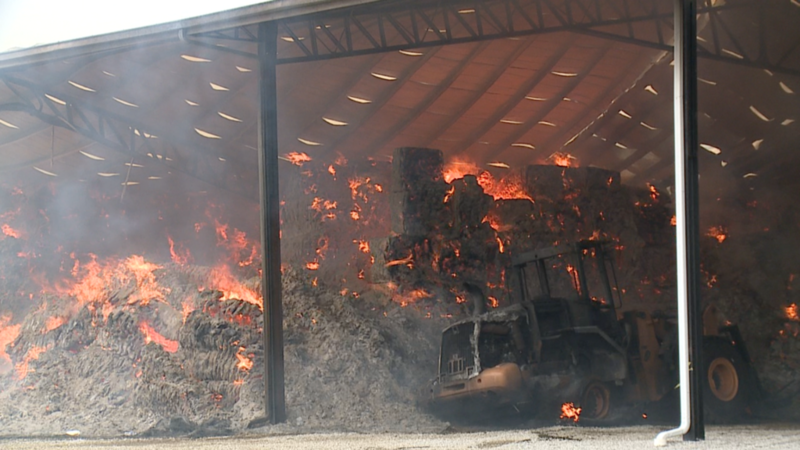 All bales are affected by this process and we never know when and which of them bursts into flames causing a fire of the whole stack. 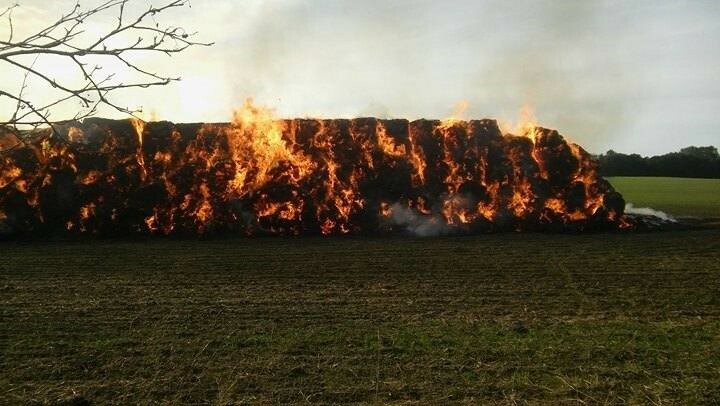 In extreme cases, many bales can ignite at the same time, which is plainly described as an explosion of the stack. Stack fires are so violent that practically nobody puts them out. Firefighters only try to prevent the fire from spreading. Even if there is no fire, just heating a bale to a temperature of above 45oC significantly reduces the nutritional value of the hay. 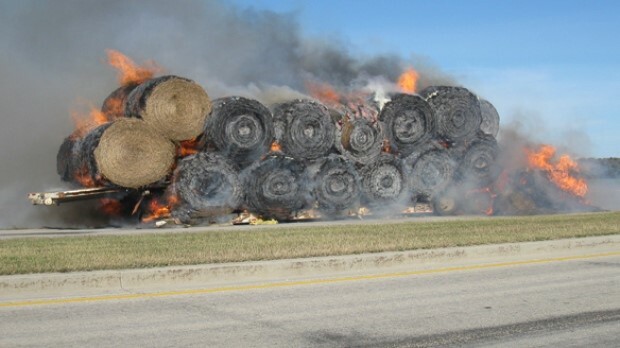 Neither scientific nor professional literature indicates methods of preventing bales of hay or straw from heating which may result in a stack fire. Only monitoring the temperature of bales in the stack is used, and in the case of over-temperature, the stack is quickly dismantled. It is known from the scientific literature that all bodies emit thermal radiation in the form of quanta of electromagnetic radiation. This process cannot be stopped. If a given body has the shape of a sphere or cylinder of radius r, then the number of quanta emitted by the body will be proportional to r2. It means that along with the increase in radius, the concentration of quanta within this body begins to increase. Such an increase in concentration will be manifested by a creation and a constant growth of temperature gradient between the surface and the center, while the maximum temperature will be in the center and the minimum on the surface. If the temperature in the center of the body exceeds a certain limit, the process of thermal destruction of the material it is made of begins. The radius at which the thermal destruction of the material in the center begins is the critical radius for this material. In a bale of hay, the critical radius is often considerably exceeded, that is why in its central part an area of harmful temperature rise is created. In this area, the temperature rises towards the center of the bale and the maximum value is achieved in its central point. According to the invention, the method of eliminating spontaneous combustion of compressed hay or straw in bales in the shape of cylinder of any diameter is that an opening is made in the central axis of a bale, in which there is placed a thin-walled metal tube, preferably perforated, acid-resistant or aluminum, open at both ends. The diameter of the tube in relation to the diameter of the bale of hay or straw is from 1.0% to 10.0%, whereas the minimum length of the tube is equal to the height of the bale of hay or straw. Unexpectedly, the research and experiments led to the conclusion that the method according to the invention allows for current transferring heat to the environment from the most exposed to heat central part of the bale, which prevents the accumulation of heat within the bale, therefore it does not allow a harmful temperature rise and thus it eliminates fire hazard in stacks made of bales of hay or straw. According to the invention, the method will be clarified and explained in the example illustrated in Fig. 1 which shows the position of a tube in the bale in a schematic view, and Fig. 2 shows a diagram presenting the distribution of temperature in the bale with a tube. In the bale 1 of hay of circular cross-section, centrally in its axis 2 passing through the center of the area 3 of harmful temperature rise, an opening is made in which there is placed a thin-walled acid-resistant metal tube 4 open at both ends. The tube 4 is perforated 5 along its entire length. The length “L” of the tube 4 is equal to the height “h” of the bale 1. The diameter “d1” of the tube 4 in relation to the diameter “d2” of the bale 1 is 4.0%. The heat generated by the self-heating bale 1 of hay accumulates in the central part 3 of the bale 1 and creates there an area of harmful temperature rise. After the tube 4 passing centrally through the area 3 of harmful temperature rise has been placed in the bale 1, the generated heat is transferred to the environment on an ongoing basis, which prevents accumulation of the heat inside the bale 1, that is, it prevents a fire of the bale, as presented in Fig. 2 which shows a diagram presenting the distribution of temperature in the bale 1 after the tube 4 has been placed in it. The method of eliminating spontaneous combustion of compressed hay or straw in bales in the shape of cylinder of any diameter, characterized in that an opening is made in the central axis (2) of a bale (1), in which there is placed a thin-walled metal tube (4) open at both ends. The method according to claim 1, characterized in that the diameter (d1) of the tube (4) in relation to the diameter (d2) of the bale (1) is from 1.0% to 10.0%. The method according to claim 1, characterized in that the minimum length (L) of the tube (4) is equal to the height (h) of the bale (1). The method according to claim 1, characterized in that the metal tube (4) is perforated (5) along its entire length. The method according to claim 1, characterized in that the metal tube (4) is made of stainless steel. The method according to claim 1, characterized in that the metal tube (4) is made of aluminum. The method of elimination of spontaneous combustion is that an opening is made centrally in the axis (2) of the bale (1) and there is placed a thin-walled metal tube (4), preferably perforated (5), made of stainless steel or aluminum, open at both ends. The diameter (d1) of the tube (4) in relation to the diameter (d2) of the bale (1) is from 1.0% to 10.0%, while the minimum length (L) of the tube (4) is equal to the height (h) of the bale (1). As it is apparent from the above, preventing fires of hay or straw consists in a permanent opening which is made while baling in the central part of a bale, or placing a metal tube in the axis of a bale after baling. A permanent opening means an opening which will not tighten up during transport or storing the bale. From a technical point of view, a much better solution would be making the opening in the center of the bale. It would, however, require some changes in the construction of baling machines, which is rather not applicable in the next few years. Therefore, a solution “for today” is placing a metal tube in the axis of a bale for the storage time. It is particularly urgent to implement this solution in the cases of transporting hay bales in lorries. In such cases there are often situations when the driver, unaware of danger, when transporting goods of little value, loses a tool of work (a lorry) worth hundreds of thousands of dollars (the Internet shows hundreds of such cases). The issue is becoming urgent because another candidate to incur great financial losses has appeared. These are railway lines, completely unaware of the danger, which also undertake to transport hay or straw in bales. gure 8. 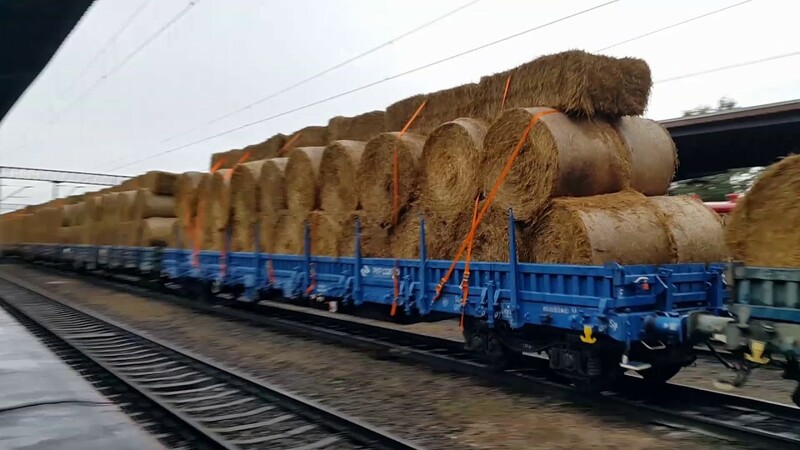 Transport of hay bales by train (Poland). In case of a fire of the train, 1800 bales of hay would burn, 30 cars and the railway infrastructure would be damaged in the range of 500m. The photo below shows how close it is to a disaster. Figure 9. 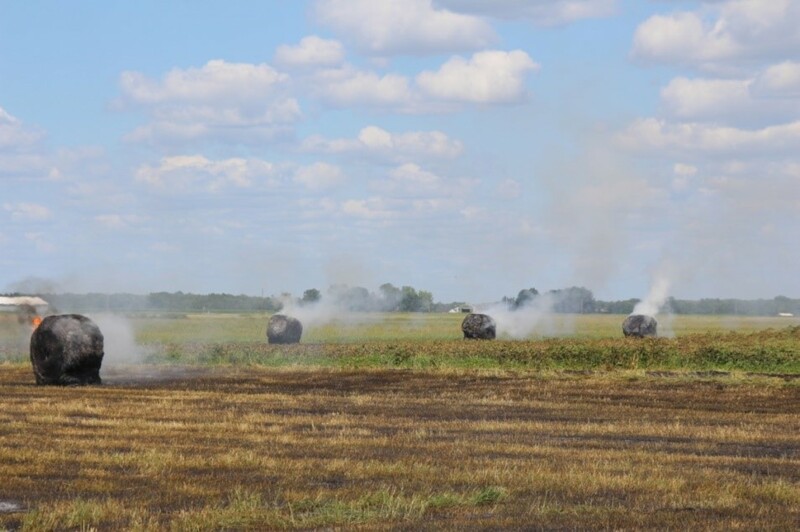 Five fire brigades were putting out a fire of hay in Węglowa Street in Kamieniec Ząbkowicki (Poland). The bales had been prepared for rail transport. Theoretical foundations for this solution allow to believe that it is 100 percent effective. Its use will make it possible to eliminate this fire “plague” in a given county, state, the entire country, and ultimately worldwide. The above mentioned patent was created in Poland, however, attempts to draw to it the attention of companies and organizations in this country (the fire department, insurance company PZU, firefighting experts) have been ineffective.